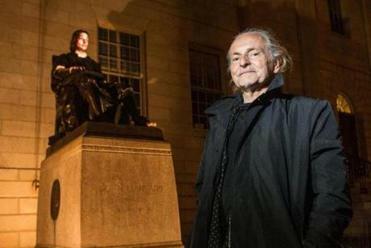 The John Harvard statue in Harvard Yard was brought to life by artist Krzysztof Wodiczko. Sitting atop a six-foot granite plinth, the iconic John Harvard statue casts a stoic gaze over Harvard Yard, silently resigned to his fate as the target of student pranks and tourists’ photographs. This week, however, John Harvard will have something to say to passersby. The campus landmark, created by the preeminent sculptor Daniel Chester French in 1884, comes alive after dark as the agent of artist Krzysztof Wodiczko’s latest public installation, a video projection that transforms the bronze statue into the likenesses of 22 Harvard students. Animated with the individuals’ images, voices and gestures, John Harvard – a 17th-century English minister who, according to the statue’s engraving, founded the institution – is no longer French’s Anglo-Saxon idealization of a Harvard student. Instead, he is a representative for the entire student body, an amalgamation of diverse voices sharing common thoughts and experiences. Wodiczko, renowned for his large-scale slide and video projections on architectural facades and monuments around the world, created the Harvard installation to challenge perceptions of what it means to be a student at the Ivy League school. The artist, who was born in Poland in 1943, has worked in North America since the 1970s, and is now a professor at Harvard’s Graduate School of Design. Commissioned by the university’s arts committee to create the public installation, he worked on the projection piece for more than a year with help from students and members of Boston’s Materials & Methods design firm. The project began with a meticulous filming process. In order to match a 3-D scan of the statue, participants had to assume John Harvard’s exact position for the duration of their taped interview sessions, which lasted approximately 30 minutes. With a small brace preventing their heads from moving, the students could gesture as they talked, but had to return their limbs to the same position after each action. The participants were asked to reflect on their experiences at Harvard, and to shed light on topics they felt needed to be brought into the public consciousness. Common themes ranged from hopes and fears to questions of identity and feelings of vulnerability, with many students dwelling on the sense of community and belonging – or the lack of it – that is inherent in the university experience. Comments such as “I feel alone, and I can almost feel [other students’] loneliness, as well” and “We’re often busy talking about ourselves, but we don’t really listen” suggest a palpable but largely unaddressed disconnect within the student body. Wodiczko hopes sharing such remarks in a public sphere will provoke dialogue and help unite the Harvard community. French’s statue assumed the students’ images and voices after Wodiczko and his team, using special mapping software, edited the videos into a pixilated image that can wrap around the sculpture’s contours. The result is a lifelike and somewhat unsettling John Harvard, with shifting hands, eyes, and lips that share each participant’s reflections, interspersed in a 40-minute loop. The John Harvard installation is exemplary of Wodiczko’s projection works. The artist often uses the intersection of art and technology, placed in the public sphere, as a vehicle for discussion of social, political, and institutional issues. One of his recent high-profile installations, 2012’s “Abraham Lincoln: War Veteran Projection,” addressed the traumatic consequences of war, projecting veterans’ images and voices onto the presidential statue in New York’s Union Square Park. At Harvard, French’s historical statue was the perfect medium for Wodiczko’s vision. Beyond being a symbol of the university, John Harvard already challenges the notion of veritas. 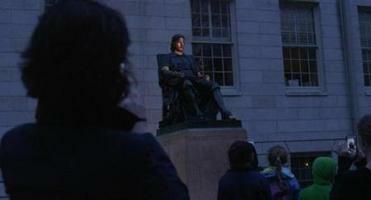 Besides not actually being a depiction of John Harvard, the sculpture contains two other misnomers, earning it the nickname “the statue of three lies.” Harvard was not the school’s founder; the general court of the Massachusetts Bay Colony founded the school by a vote in 1636 — not 1638, as it is inscribed on the statue. Harvard was merely the first major benefactor. To Wodiczko, those glaring inaccuracies mirror what students might feel the need to repress in order to fit in. The John Harvard projection, which is visible after dark, will be on view through April 27.